These papers are primarily made up of signed military oaths and muster rolls, arranged alphabetically by county. They chronicle the organization of small, township militias across the state, including the Humboldt Rangers, Little Osage Cavalry, Huron Home Guards, Barnesville Home Guards, Padonia Frontier Guards, LeRoy Scouts, Greenwood Township Rifle Company, Circleville Riflemen, Bainter Rangers of Jefferson County, Twin Springs Union Guards, Cavalry Company at Neosho Falls, among many others. 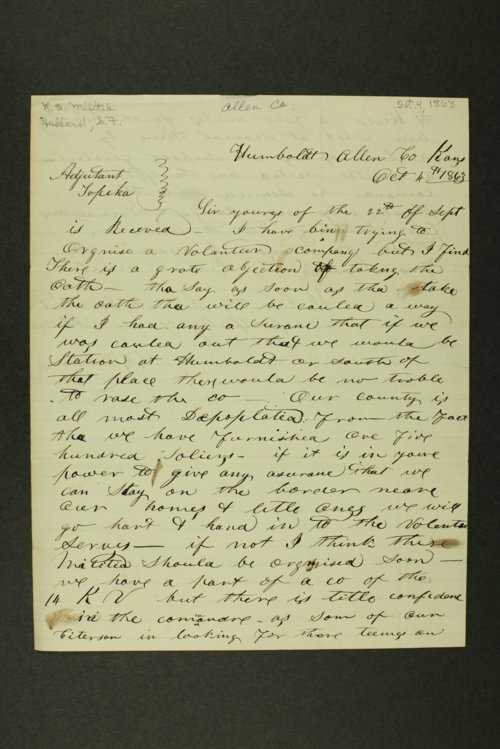 Also included is correspondence between the citizens volunteering for the Kansas State Militia and government officials, including Adjutant General Guilford Dudley, Adjutant General Cyrus K. Holliday, Governor Charles L. Robinson, and Governor Thomas Carney.